It is estimated that 70 percent of the American population is missing at least one tooth, with the highest incidence being one of the molars. But should you get a missing back tooth replaced? Or are the remaining teeth adequately functional? You need 28 teeth – not necessarily 32. First, it is important to note that adults have a maximum of 32 teeth. The third molars, or wisdom teeth, develop later at around the age of 20. If you don’t have enough room in your mouth to accommodate these four teeth, they can be extracted because you don’t really need them. But the remaining 28 teeth are necessary for proper function of the mouth, as well as to prevent the remaining teeth from shifting. Second, when you lose any tooth, especially a molar, the efficiency of your mouth diminishes, and function is affected. When you have a gap between your teeth, you cannot chew properly. It could mean that you have to rely on one side more than the other, stressing the teeth on that side, or that you don’t chew your food properly before swallowing, resulting in digestive problems. Ultimately, you will have to give up eating some of your favorite foods that you cannot chew thoroughly. Third, when you have spaces between your teeth, other problems begin to occur. 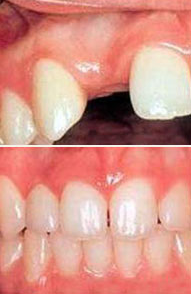 The teeth on either side of the gap will begin to tilt off their vertical axis and shift into that space. This can weaken the teeth and create additional spaces between them that are hard to clean, increasing the risk of plaque buildup, gum disease, and decay. When teeth tilt and shift, the root structure that usually stays below the gum line could also become exposed. If your teeth are still developing, the opposing teeth in the upper or lower jaw could also grow faster (or slower) and longer into the missing tooth space; a condition known as super-eruption or extrusion. All these problems arise because of a single missing back tooth. If multiple teeth are lost, more serious problems can occur, including loss of the arch length (distance from the end of the last tooth on one side of the mouth to the other side); and loss of vertical dimension (diminished distance between tip of your nose and your chin). This can lead to severe cosmetic problems, and cause your face to age considerably. So, losing a tooth is very serious, and it should be replaced as soon as possible with a dental implant, bridge, or denture. This is to be determined by your dentist.